In a recent interview, Vinod Daniel, internationally known -senior conservator and specialist in museum management, has highlighted the community’s responsibility in preserving the irreplaceable historical and cultural links with its past. Enthused by this interview, N.S. Parthasarathy visited some of the city’s museums and recorded his experiences. This is the first article in this series. As people do not -generally make repeat visits to museums, or at close -intervals, these articles, we hope, will be of some use in -evoking recollections and inspiring a visit once again. Among biographical museums, the one focusing on the life and achievements of Ramanujan fires a visitor’s imagination and curiosity the most for his stranger-than-fiction rise from abject poverty and social rejection to lasting fame as a mathematician. It is but fitting that a museum dedicated to him should be located in Chennai where he spent his early years working for the Port Trust as a lowly clerk earning him just enough to avoid starvation so he could pursue his life’s passion exploring the abstract world of mathematics and its mysteries. Established in 1993, the Ramanujan Museum and Math Education Centre was founded by the late P.K. Srinivasan, educationist. The founder approached several people for space to exhibit the collection. 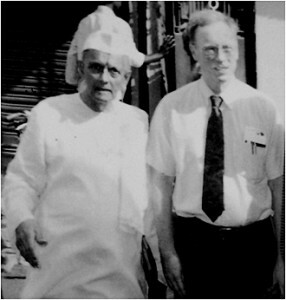 It was Bose, the present Secretary’s father, who offered space in his building in Somu Chetty 4th Street, Royapuram and became its co-founder. More by compulsion of circumstance than for its suitability, the museum came to be housed at this location, not very far from Saiva Muthia Mudali Street off Broadway where Ramanujan lived when he was working as a clerk in the Port Trust. It is a narrow street in a crowded section of north Chennai. The approach lanes and by-lanes to reach this location are not wide enough to permit even one-way traffic but do allow two-way chaos. You can, with patience, a couple of gashes to the car and damage to the headlight, just about manage to crawl through the congestion to the museum. A more central and prestigious location would have done greater justice to the memory of one so distinguished. The main collection of artefacts, documents and photographs are on a first floor non-airconditioned hall measuring about 600 square feet. On this floor there are over two hundred exhibits and quite a few of them originals, ‘preserved’ in glass frames and a few displayed bare. 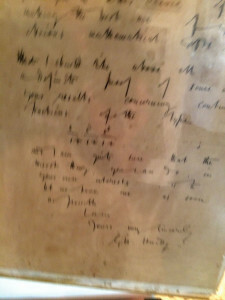 Among them are Ramanujan’s horoscope in original, his handwritten letter from England, in Tamil chain script to his elder brother – Anna – couched in traditional respectful language with an opening invocation seeking the blessings of Sri Ramanuja-charya, and a large framed grainy black and white portrait photograph showing him in formal dress looking down on his memorabilia stored in an unknown, unrecognised corner of the city symbolising his own early struggle for recognition of his extraordinary mathematical insights. The photo of the Town High School reminds the visitor of how, while still in school, Ramanujan came across a copy of Carr’s Synopsis, a compendium of numerous basic theorems and results in pure mathematics. There being no display of a replica of this book is a significant omission. For it is this book and its concise style that affected Ramanujan’s mode of presentation of his theorems, leapfrogging several logical steps to final results and not explaining the proof that scientific rigour demanded to merit acceptance of the validity and originality of his discoveries. The display of a specimen of the front page of the Journal of the Indian Mathematical Society reminds us of Ramanujan’s brilliant research paper on Bernoulli numbers in 1911 published in that journal. That was the very first milestone of his becoming well-known in Madras circles as a mathematical genius despite lack of university education. 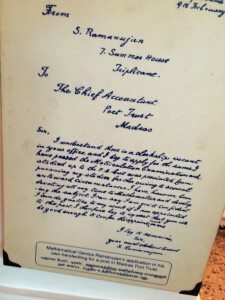 Ramanujan’s handwritten application – I beg to apply for clerkship – to the Madras Port Trust stating that he had passed the Matriculation examination and was prevented from pursuing “studies beyond F.A.” (Fellow of Arts, in those days) owing to “several untoward circumstances”, is a moving piece on display. His biography says that he was recommended to the job on grounds that “he has a natural aptitude for computation and is very quick at figure work”! Apart from celebrating the genius of Ramanujan, the Centre has special programmes to spread awareness of mathematics among children to enable them “to seek and understand the world around them in the stance of numeracy”. To make this programme interesting and meaningful numerous tools have been developed for children, giving full play to their sense of curiosity, to manipulate them in different ways and discover meanings. These “mathematical manipulatives” have been designed and developed by the late P.K. Srinivasan. About 70-80 training camps are conducted by the Centre at various venues where the focus is to teach teachers in use of maths manipulatives. They, in turn, are enabled to teach children, thereby multiplying the coverage. The kits, hundreds of them in various configurations, displayed on the upper floor are colourful, attractive, durable and suitable for sharing among players. The kits are made and sold by a separate associate body that pays a royalty to the museum which is a registered non-government organisation prohibited from profit-oriented activities. No government aid or support is received and, therefore, the museum is able to supplement the royalty on kits to the meagre entrance revenue, which is Rs. 10 for adults and free for schoolchildren. The average daily footfall is hardly 5-10 with spurts of batches of schoolchildren on periodic conducted study visits. Occasional donations are an additional source and most welcome. Rising costs of maintenance are a source of concern. The last eminent visitor was Dr. Bruce C. Berndt, Professor of Mathematics, University of Illinois at Urbana-Champaign, USA, in 1990. The Centre arranges an annual lecture by an eminent mathematicians on the occasion of Ramanujan’s birthday on December 22nd. Ramanu-jan’s widow’s adopted son used to attend the annual function regularly till he passed away recently. The museum seems to be run more by passion than money. Surely it deserves a better venue and a grander display of the memories of one of the greatest sons of this land. This exhibition in memory of the “man who knew Infinity”, is poorly lit, its collections crowded into a small space and amateurishly preserved for want of resources, epitomising the Master’s early days of poverty and of his genius craving for the world’s attention. 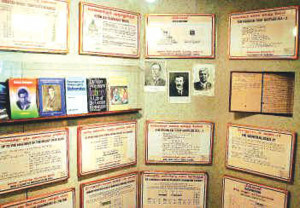 For a full-blown moder-nised exhibition of not only artefacts, photos and rare documents but also for an elaborate demonstration of Ramanujan’s mathematical models, large space and scientifically designed show-cases are needed. Can some organisation help with both?